I was kindly invited, earlier this week, to take part in “insideHERE” in Berlin, a small event run at the HERE HQ in Berlin. HERE, being born out of the ashes of Navteq and Nokia Maps, is now owned by a consortium of German car companies. For the special event, HERE’s developers and engineers opened up their research labs and revealed their state-of-the-art mapping and location services work. 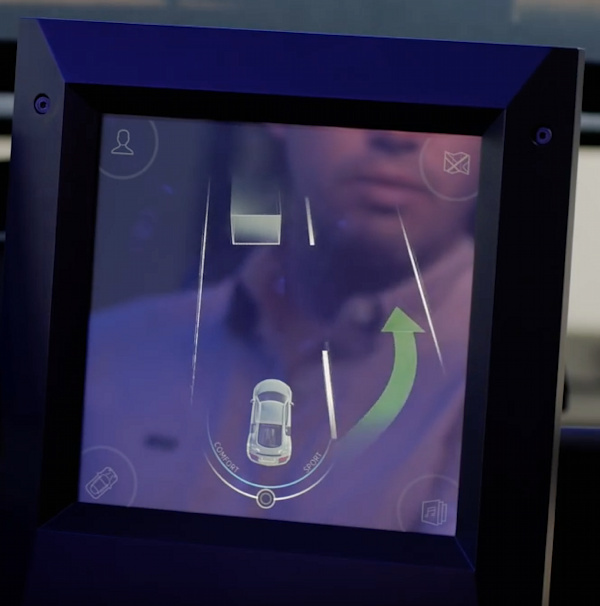 HERE Auto is making a real play to be the “Sat Nav of the future”, competing directly with Google and Apple to create, manage and augment data between your smartphone and your car. Tomorrow I’ll outline the general visualisation work I saw that demonstrates their high-precision spatial datasets, but first, today, I mention one particular research project which shows how maps will be continue to be a crucial part of driving, even when cars drive themselves. “Knight Rider” is a test rig, built to simulate a car, where the engineers and UI/UX designers can try out different configurations and locations of controls and maps on a dashboard. They key aspect being tested is how much trust the user can place in the car, based on what they can see and information that is displayed. Testers can sit in the “car” and drive it, to experience map/control designs and, crucially, how it feels to give up the steering wheel but continue to have the confidence that the journey will proceed as planned! Large exterior screens, fans and a windshield provide some depth of realism. The intention is not to create a realistic driving simulator, completely with fully photorealistic buildings and roads, but instead to get the tester as comfortable as possible to evaluate the designs effectively, before they are put in a real test car on the road. 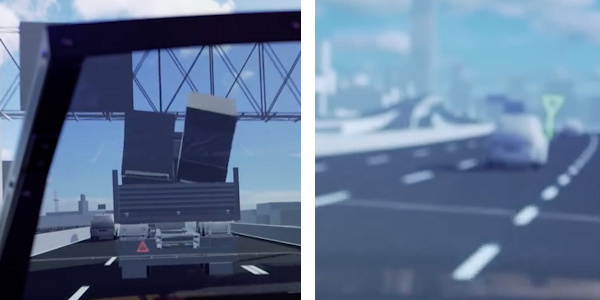 When we saw the rig, it was configured with maps in three places – a short but wide one that wraps across the dashboard, a circular map that sits just to the right of the dashboard, beside the steering wheel, and finally a heads-up display (HUD) that reflects in the windshield, this achieved by a carefully angled screen pointing upwards. The key interaction being tested is changing from human to computer controlled driving, and back. The first is achieved by listening for the comptuer voice prompt, then letting go of the steering wheel once asked to. If you don’t retake control of the car when you need to, for instance as you are changing onto a class of road for which autonomous driving is not available, and you have ignored the voice prompts, then then the car will park up as soon as it’s safe to do so. It’s an impressive simulator and crucial to shaping the UI of the autonomous cars which are starting to appear on the horizon, in the distance, now. Photos and video courtesy of HERE Maps. GIS software is used by many professionals to process spatial information, but the results are often poorly presented and the resulting map can be unattractive. GIS packages, such as QGIS, are increasingly including a broad range of cartographic styling and map design options, to present synthesised spatial data attractively, but it remains all too easy to produce a map without due consideration for its presentation. The old, non-geospatial approach produces beautiful maps in regular graphic applications, e.g. Illustrator, but these lose the data linkages and spatial analysis capabilities of GIS that produce the data to be mapped in the first place. Then there’s the new “slippy map” online map websites that provide a whole new set of tools to allow anyone – be they a geospatial professional or not – to create maps. It can however be all to easy to produce maps with these tools that are unhelpful, look ugly, are difficult to interpret or worst of all are downright misleading. GIS Cartography, by Gretchen Peterson, is a book that seeks to address these problems, seeking to guide GIS software users and web designers alike to produce maps that contain good cartographic design, harking back to when maps were produced by a dedicated “offline” cartographer. The book does this by taking a structured approach to the elements of data-driven maps, and examining and commenting on each of these in detail. The book is largely technology-agnostic, not detailing operations for specific GIS software or online mapping APIs but instead outlining the basic concepts of good digital maps that users of such software should normally be able to implement. Peterson is not afraid to espouse her opinion – her experience in the field means that her view is a salient and sensible one. For example, the author has a distinct dislike for the use of logos on maps – arguing for them to be minimised – or ideally dropped altogether, while making the creator’s name more prominent than is often the case. I particularly liked the discussion on fonts and the display of text – perhaps not an area traditionally dwelled on by GIS-focused map makers. For example, different kinds of text halo application are demonstrated well, with a set of excellent graphics. One section of the book that I felt was overlong however was the section on the colour palettes for feature types. Gretchen is attempting to cover all common types of GIS maps (from political to soil) but the detail is overwhelming. By contrast, the section detailing colour blindness issues with maps (which I frequently get caught out with) was succinct. Online cartography is dealt with in the last chapter “Zoom-Level Design”. This section reflects the recent rise of online mapping software (Google Maps, OpenLayers, Leaflet, etc) used by non-professionals, with the core part of the book solidly focused on the regular desktop GIS (ArcGIS, QGIS, MapInfo, etc). 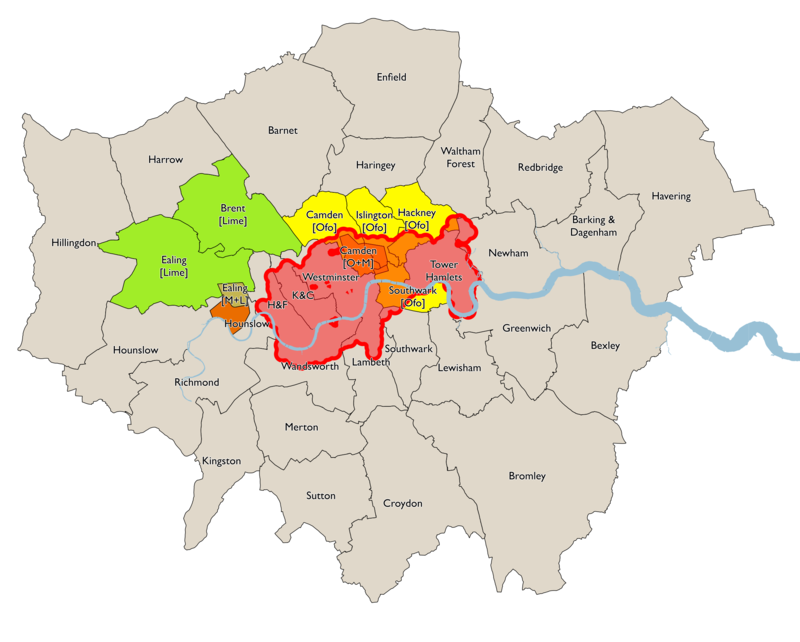 The section focuses on the issues of scale and generalisation for maps designed to be viewed rapidly at multiple zoom levels. Ideally the book would integrate the online and offline (or “slippy map” and “GIS window”) worlds throughout its length rather than addressing online mapping in a single chapter. Of course, many of the aspects presented in the main part of the book – particularly relating to colour and adornments – are also applicable to this kind of mapping. One slight irony is the variable quality in the design and reproduction of the illustrations in the book itself. Many of them are rather traditional looking, and some are quite pixellated. The generic look is likely because of the desire of the author to keep the book as neutral and platform-independent as possible. Overall this is an excellent and comprehensive guide to ensuring high quality cartographic output from GIS users and slippy map creators. If you read it from cover you’ll build up an excellent set of guidelines for maps with a rigorous high quality. Alternatively you can dip in to it from time to time when you need advice on specific aspects of your mapmaking, such as tips on how to do scale bars or inset maps well. Even if you are already experienced with mapmaking from GIS software, you’ll quite become aware of design aspects you hadn’t previously considered. If you regularly create online maps, or find yourself increasingly using a GIS to create and output maps straight for presentation, this is an essential book in your professional collection. Author: Gretchen Peterson, Publisher: CRC Press. 299 pages. Out now. Thanks to the Society of Cartographers for arranging a review copy. This review may appear in the society’s Bulletin in due course. I am happy to accept copies for review of other books in this and related fields – send to Oliver O’Brien, Dept of Geography, UCL, Gower Street, London WC1E 6BT. Review copies can be returned on request, if an SAE is included.